is Associate Professor of Indology at Kyushu University. The present volumes present a critical edition and an annotated translation of the codanāsūtra section of Kumārila's Mīmāṃsā -Ślokavārttika, which is a sub-commentary on Jaiminisūtra 1.1.2. Kumārila is commonly regarded as having been one of the most brilliant brahmanical philosophers of the Classical Period in India, a thinker whose ideas influenced almost all later brahmanical thought. Of his works, the Ślokavārttika is possibly the most important. Defending the authoritativeness of the Vedic scripture, in the codanāsūtra section Kumārila discusses theories concerning truth, omniscience, and ritual killing. This section is a rich source of brahmanical thought on philosophical, religious and ethical questions during Kumārila's lifetime and before. The new edition, the first serious attempt at a text-critical study of the Ślokavārttika, is based on seven published editions and five manuscripts, as well as readings suggested in commentaries on the text, testimonia of other authors, and parallel passages in Kumārila's other writings. The volumes also include an introduction containing a survey of the conducted research, an investigation into the dates of Kumārila's floruit, his relationship with Dharmakirti and the problem of the Bṛhaṭṭikā, as well as an analysis of Kumārila's theory of truth. 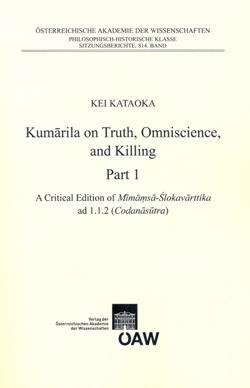 A separate synopsis and summary provide an overview of Kumārila's discussions. Detailed annotations present the background of the views expressed in the verses of the text, together with detailed analyses of Kumārila's ideas. Together, these two volumes provide an extremely valuable contribution to the field of Indian philosophical studies.